Manchester United ready to offer £30m for Radja Nainggolan Manchester United boss Louis van Gaal is hoping to seal the deal of Roma midfielder Radja Nainggolan, as per Daily Star. Manchester United boss Louis van Gaal is hoping to seal the deal of Roma midfielder Radja Nainggolan, as per Daily Star. The Red Devils have been quiet this month as compared to their summer transfer window. They have only signed goalkeeper Victor Valdes which was signed on a free transfer. United have not signed a midfielder or a defender this month, despite of having so much talent in the midfield they are still looking for a big swoop of a midfielder. His arrival means that Manchester United will not go for his teammate Kevin Strootman in the summer who recently picked up a knee injury. Strootman was linked with a move to Untied heavily, however his injury problems have taken away the interest from the Premier League side. 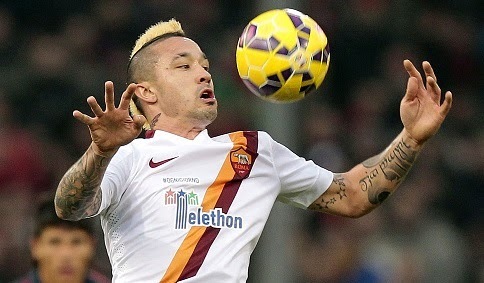 Nainggolan move would be great for the Red Devils, however he will have to struggle in getting a regular place. Daley Blind, Michael Carrick, Marouane Fellaini and Ander Herrera all are taking the same role as of the Belgian, even skipper Wayne Rooney has been seen in that role this season. Meanwhile, Liverpool are also targeting the 26-year-old midfielder, as per several reports.